I just finished putting up our Day of the Dead altar. Candles, marigolds, a sugar skull wearing a mariachi’s sombrero, and traditional Mexican figurines - skeletons dancing, teaching, sitting in a booth at a restaurant, death in normal places, because in Mexico death is normal, not something to fear. The photos are up: parents, grandparents, the recent dead, like our dear friend Aldo who could go nowhere without music. For a week after he died, both Bill and I kept hearing his favorites. The sound so filled the house that when a group of women arrived I actually warned them that the house was haunted by music. There is a group photo on the altar of that extraordinarily lively bunch, my father’s family. Though I haven’t seen many in decades, they are instantly present - and thoroughly themselves. I miss them and mourn them. 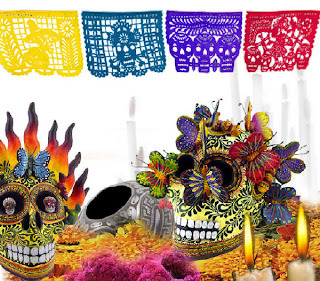 My friends at the national university (UNAM) tell me it is time to purchase calaveras de sucre, sugar skulls, for those I'm close to, with their names written in frosting. They are in the windows of every bakery. 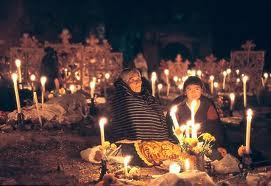 Julio and Rosana tell me we will be going to the island of Janitzio in the state of Michoacan for Día de los Muertos. Then I might really begin to understand their country. We take a second class bus to Patzcuaro, and a boat to the island. The sun is setting. The silvery lake turns orange, the color of this holy day. A parade of torch-lit fishing canoes passes us. The fisherman are performing a ritual of gratitude, and we watch a ballet of butterfly shaped nets. After Mass, a crowd of the P’urhépechas, as the people call themselves, emerges from the church, and immediately a group of men grab sticks from a pile, use them as canes, and begin the Danza de los Viejecitos, the little old men. They are very convincing, and very funny, and my friends tell me this was a Pre-Columbian dance to the sun god. I don't ask them why this particular dance was used to honor the sun god, and I still don't know the answer. And then the procession begins. Men, women and children are carrying torches, candles and tall wooden arches covered with cempasuchil flowers, the orange marigolds that have been used to honor the dead for milennia. The color symbolizes the earth, and it is these flowers that will guide the spirits to both the home altar, and the one they are now creating on the graves of their ancestors. Baskets of fruit are placed next to the grave, the wooden arches, like blossoming sculptures, are erected over it, and tall tapers placed around it. And then the chanting and singing begins - the night is all and only candleglow and sound. There is only this place, and those voices. It will last till dawn, and we will remain, without sleep, but not the least bit tired. And the light and song are no longer outside us, we are no longer curious observers. The ritual has entered into me, become me - and it has remained there ever since. Tonight I will light orange tapers on my altar, and sing to my dead. is Professor Emerita of Humanities and Philosophy at the College of Marin. Her poems have appeared in many journals and anthologies. Her chapbook, A Flash of Angel, won the Blue Light Press prize, and Adorning the River, won the Red Berry Press chapbook prize. Her book of poetry, After the Jug Was Broken , and her anthology, The Book of Now: Poetry for the Rising Tide, are available from Fisher King Press or Amazon. Leah has been a weaver of wall hangings as well as words, an ardent gardener, life-long seeker, social activist, and a crone-in-training.